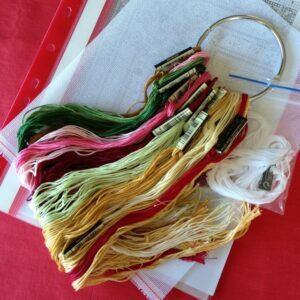 I’m just days away from finishing my set of bird cage scissor fobs and nothing hurries me along better than the promise of a new stitching project to begin. As usual I’ve got my cottons and fabric all ready to go so I can begin stitching the next project as soon as I’ve finished the current one. I hope to post again soon to show off my Ornate Cages. This entry was posted in Miniature Carpets & Rugs on February 5, 2016 by Elli Jenks.